Zombie Infection Calculator | We Zombie! ← Zombie School – You Thought It Was Easy? Something that everyone should know – and perhaps it should be required to laminate the results and carry them in your purse or wallet – because you never know when you will be given that look from friends and relatives after you’ve become contaminated. It becomes a very suspicious waiting game. If you can show your calculated zombie infection time, and the time has sufficiently passed, they may let you live – although you will still be watched. 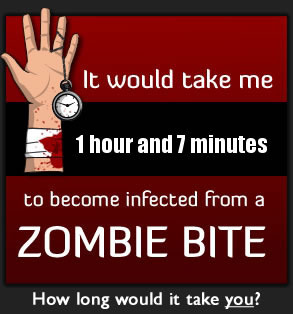 The Oatmeal.com has a cool zombie infection time calculator on the site. Take a moment to answer a few questions and find out how long you will have to wait after contamination before anyone will trust you once that day comes (let’s hope you are smarter than that). Well, provided we got bit at the same time, we could party together for about an hour – but you would be one across the table with a beer in your left hand and the shotgun in your right!